Let's go make some fantastic HOT, Chocolate-Oatmeai Cookies! Combine 1/2 C room temperature butter with 3/4 C granulated sugar in a bowl and beat it 'til fully combined and fluffy. Add 1 lightly beaten egg and 3/4 tsp vanilla extract and beat until smooth. In a separate (larger) bowl combine all the rest (dry) ingredients. Stir them together until they are fully integrated/blended. Add the wet ingredients to dry and stir together 'until they are fully blended. Use 2 soup spoons to apportion and form the cookies. Drop them directly from the spoons onto the cookie sheet. Bake cookies for 9 to 11 minutes or until desired doneness. Remove them to the wire rack to cool. Use 2 cookie sheets to complete the baking stage faster - preparing one sheet while the cookies on the other bake. Leave the baked cookies on the sheet before removing them to the cooling rack - this makes a crisper cookie (the cookies coninue to bake while they sit on the sheet - as well as setting). If removing the cookie right away, lift them very carefully, with a spatula to avoid breaking them. Bread flour will make a crisp, hard cookie. All purpose flour makes a cookie of average hardness, while pastry flour will make a softer cookie. 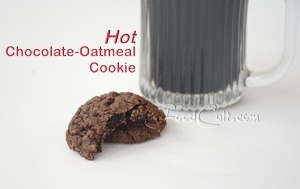 The HOT, Chocolate-Oatmeal Cookie was inspired by a trend toward adding intense spice to chocolate confection. This cookie really is an adult cookie - children do not, typically, enjoy this particular treat. This cookie, while intensly chocolate, is not particularly sweet. It features a slight, sharp undertone from the addition of cayenne pepper. As with all cookies we recipe, this is a butter cookie. It is, additionally, a high fiber cookie made with part whole wheat flour, part white flour and an abundance of large-flake oatmeal. You may choose to substitute out the butter - using shortening instead. We, however, prefer the natural (butter) fat. If after making this recipe you wish to try increasing a spice we recommend doing so very carefully. In the course of development we tried it with less and with more spices. We found this to be the most palatable balance ... as did our testers - people to whom we gave samples of different preparations for comparison.